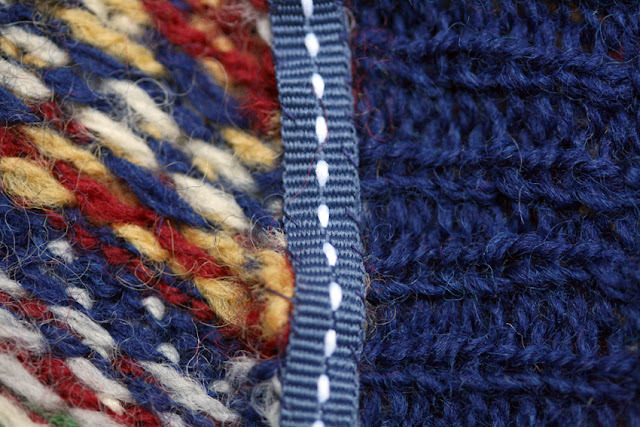 I have recently been designing and knitting a thing with steeks, which required finishing. This project is part of an exciting collaboration, and I’ll be able to tell you (and show you) more about it in a couple of weeks. When working on the steeks, it occurred to me how many different ways there are to finish them, so I thought I’d describe exactly what I did with this project, and show you some different finishes I’ve seen, in different contexts. I generally swatch in the round, and this project was no different. 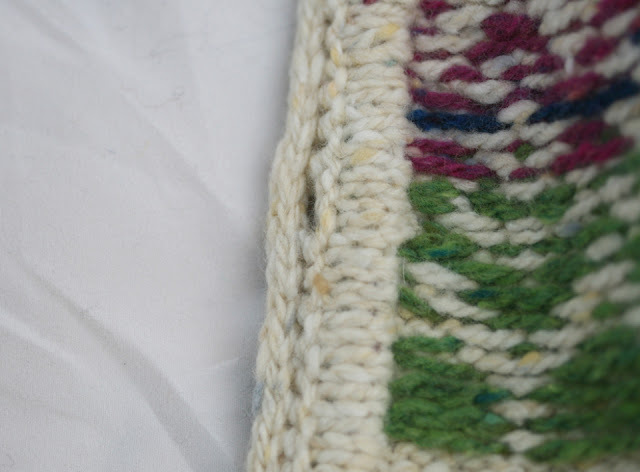 When working a swatch, I always add a few extra steek stitches to enable me to cut the swatch open, and block it flat, before measuring my gauge. Because I’d tested the yarn in this way, I knew from my swatch that the fabric was “sticky” enough to bear cutting without reinforcement so – shock horror – that is what I did when cutting the steeks on this project. I then picked up ribbing around the steeked edges, and washed and blocked the project to the required dimensions. When the project was blocked, I returned to the steeks and trimmed them right back so that only a narrow raw edge remained. 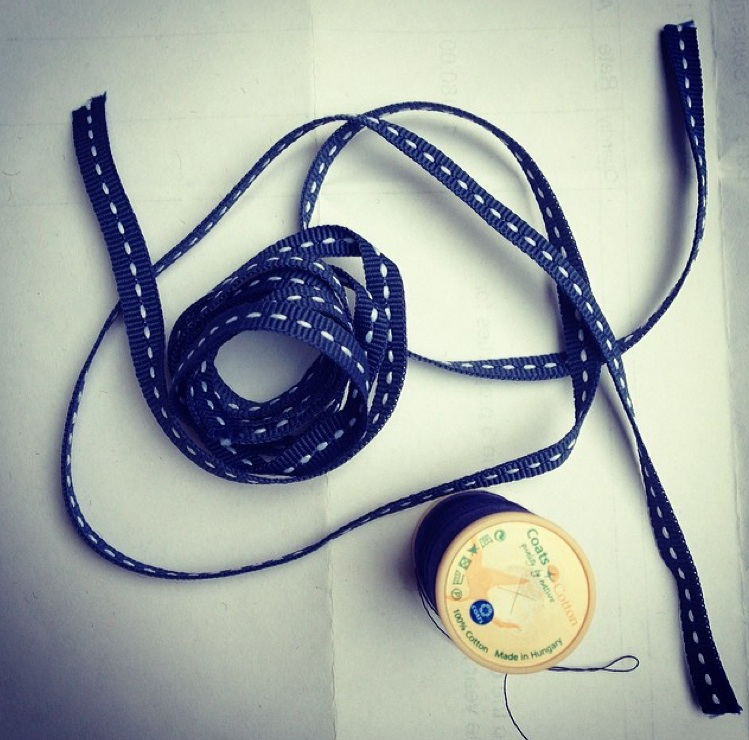 I then cut a length of narrow grosgrain ribbon, and positioned it over the top of the raw yarn edges. I pinned it down, easing the binding around the project’s curves, in the same way you’d do when preparing to machine sew.
. . . I then hand-stitched the ribbon down, securing the raw edges with my stitches, again taking care to ease the binding around the curve. The end result is very stable, and gives a neat, bulk-free finish to the inside of the project. It should also mean that this project will stand up to wear for quite a while. 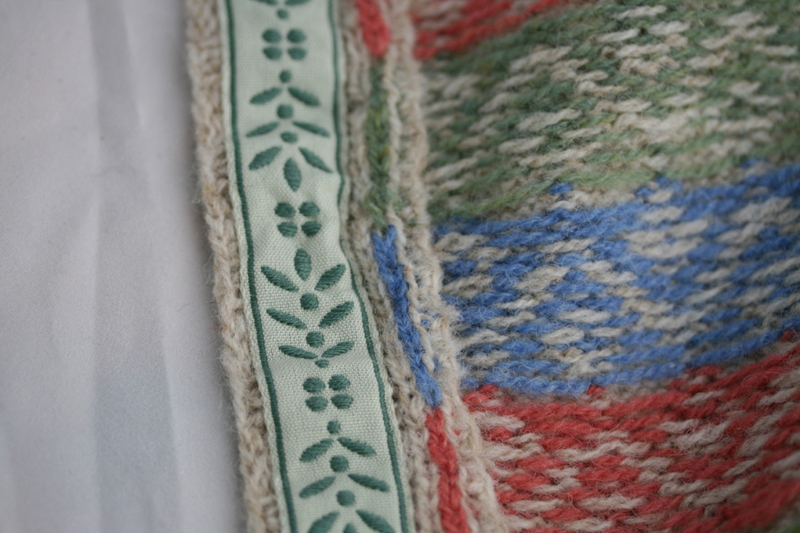 I am very fond of using ribbon, in both a decorative and a functional way, for finishing a steek edge. 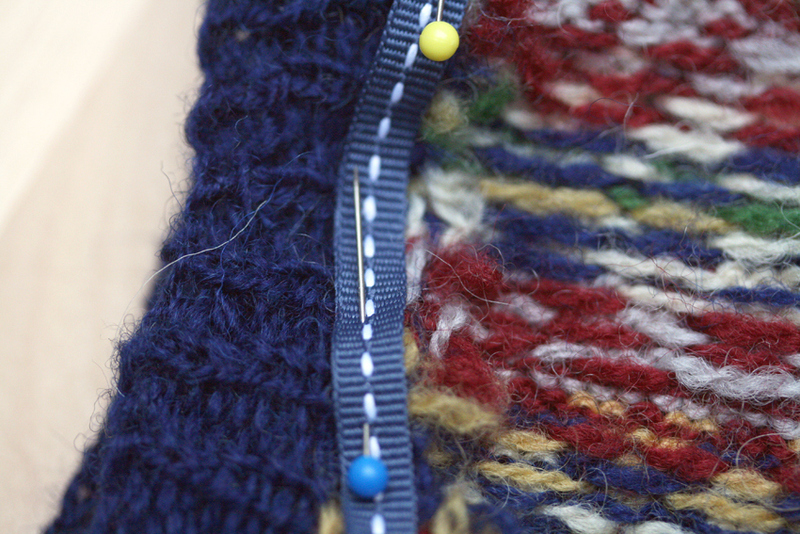 Here is the inside of the front button band of my Ursula cardigan. 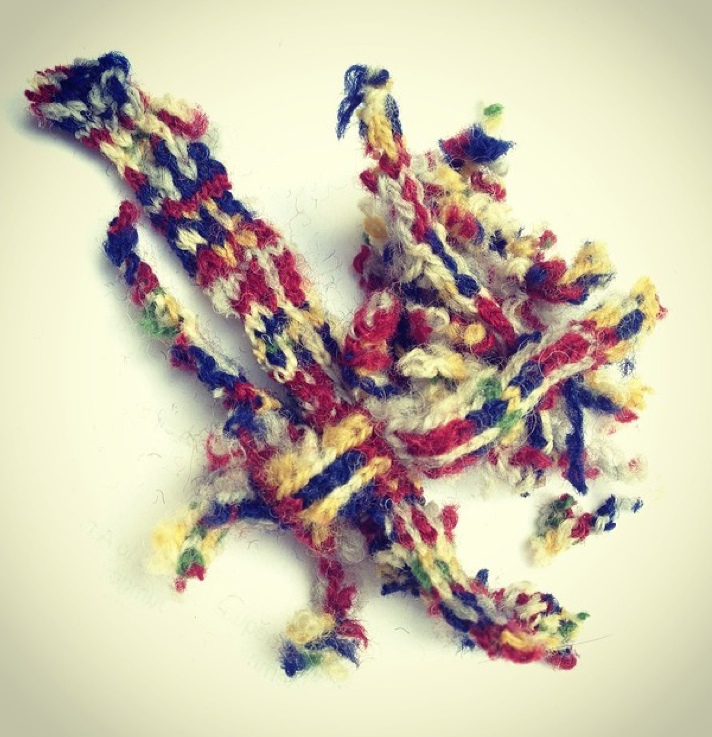 In this instance, the steek edges were reinforced with a crocheted chain, which was then carefully unpicked, before being stitched down. I didn’t trim the steeks back in this instance, but I think it makes a kind of sense to do so when reduction of bulk is crucial to the line and structure of a garment, such as around an armhole edge. 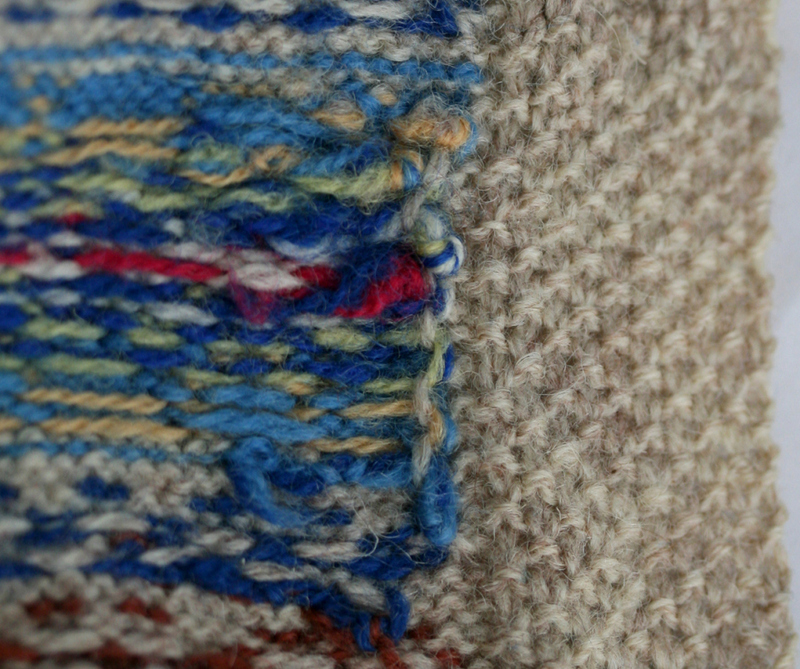 You can see how, in this vintage cardigan in my collection, the steek has been trimmed right back and the edges stitched down to the inside.
. . . and here, in this garment in the collection of the Shetland Museum and Archives, the steek edges have been trimmed back and blanket-stitched in quite an attractive way. Finally, here is my steek sandwich – in which two separate layers of stockinette conceal and contain the raw steek edges. I hope these different steek finishes have inspired you to chop up and stitch down your knitting without fear!